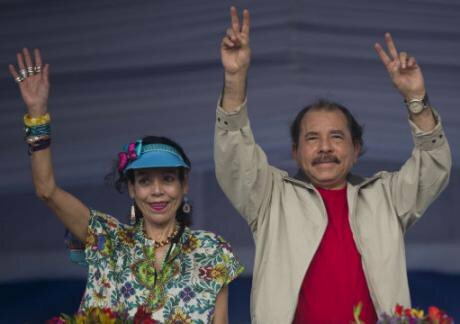 Nicaragua's President Daniel Ortega and first lady Rosario Murillo, wave to supporters during an anniversary of the Sandinista National Liberation Front in Managua, Nicaragua, in July 2015. (AP Photo/Esteban Felix). The democratic transition that we Nicaraguans began in 1990, and the peacebuilding we undertook after a tragic war between brothers, relied on an essential foundation: honest and transparent elections. Respect for the popular will is what, in our recent history, has made it possible for our country to open a period of freedom, rights and the rule of law. We have reiterated that holding periodic, free and transparent elections is the peaceful and civilized means for electing authorities and defining the course of the nation, with due respect for the fundamental rights of Nicaraguan citizens, without exceptions and exclusions. We affirm, yet again, that only democratic coexistence opens up real opportunities for employment, justice, better salaries and equal opportunities, and thus for improving the living conditions of families. Quite the opposite happens in dictatorial regimes, where the rights of all are threatened, including today’s holders of the illusion of control and security. • The late call for elections and an electoral calendar that leaves out some important aspects of any transparent and democratic process. • The refusal to accept independent, national and international observers. • The exclusion of opposition political forces by way of divesting their legitimate representatives from legal representation. • The appropriation by the ruling political group of the whole electoral structure, including the municipal, regional and departmental electoral councils. • The use of collaborationist groups as a means to show a fake pluralism. • The anomalous voter registration process and the setting up of the electoral roll. • The recall of the right of representation and the coup d’état against the legislative branch through the stripping of their condition of deputies twenty-eight representatives elected by more than thirty percent of the voters at the 2011 elections. • The attempt to establish a one-party system and to impose a dynastic regime by nominating Mrs. Rosario Murillo candidate to the Vice-Presidency of the Republic. • The artificial creation of international friction with the aim of distracting voters’ attention and setting up conflict scenarios, regardless of their serious consequences for entrepreneurs, exporters, workers and the national economy as a whole. The facts so far described confirm that what we are witnessing is a crude maneuver aimed at distorting the popular will, and not, by any means, a genuine electoral process. In these circumstances, we consider it a moral duty and a patriotic obligation on our part to reject the electoral masquerade the dictatorship is trying to carry out and to state, as that other Group of 27 did in 1974: there is no one to vote for! The closing down of democratic spaces has revealed - before the nation and the world – that the ruling group, aware of its weakness, is afraid of the expression of the will of Nicaraguans, and so is preventing honest, transparent and inclusive elections. If, through fear of the citizens’ vote, they close the door to democracy, we have then the duty and the right to open another door, a big one, leading to powerful results: peaceful resistance expressed in ACTIVE ABSTENTION. Under Article 30 of the Political Constitution of Nicaragua, which states: "Nicaraguans have the right to freely express their thoughts in public and in private, individually and collectively, orally, in writing and by any other means", our call to the nation is clear and resounding: we Nicaraguans should not go to the polls in November. This is a legitimate and effective way to assert our right to build our future in peace, democracy and freedom. Nicaraguan brothers and sisters: not to vote in this flawed process is a positive and convenient action for our future, because it is the door of hope that we citizens will open wide to finally reach the winds of change and build, without returning to any past, the Nicaragua we long for, stable and at peace, where all voices are heard and attended, with progress without preferential treatment or corruption, with independent branches of government, respect for public servants, decent jobs, education and quality healthcare, protection of our natural resources, and where conditions are met for the pursuit of happiness of our families. We urge the unions, and the country’s political and social organizations to unite their voices and efforts to peacefully oppose the dynastic pretensions of the regime and its efforts to consolidate a dynastic dictatorship. We thank international organizations for condemning the dismantling of democracy in our country, and we encourage them not to cease in their efforts to consolidate their relations with the people of Nicaragua and Central America, despite the isolation that the current regime intends to condemn us to. We ask you not to change your commitment to our country’s freedom and peace, and not to compromise your good faith in the face of the maneuvers aimed at legitimizing what is clearly illegitimate. For this very reason we also urge the Secretary General of the Organization of American States (OAS) to submit without delay its Report on Nicaragua, in compliance with Article 20 of the Democratic Charter, and the peoples and democratic governments of the Americas and the European Union to express their opposition to the electoral masquerade which aims to plunge us into dynastic oppression. Managua, Nicaragua, on the ninth day of August, 2016.